Gabriel, Peter, Inxs, Dina Carroll, Duran Duran, Drmc and more. On the evening of Friday 13th November 2015 a series of coordinated terrorist attacks occurred in Paris and its northern suburb, Saint-Denis, killing 130 people. 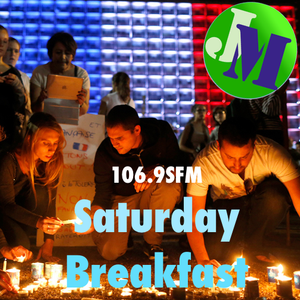 Jason McCrossan&apos;s 106.9 SFM Saturday Breakfast show was broadcast the following day and reflected the shock felt in the UK and around the world.